This is a delicious novel. One reviewer in fact warns: avoid reading while hungry. It is written by an American, Nicole Mones, who ran a textile business for l8 years in China before returning to the U.S. where she writes for “Gourmet” magazine. She combines a sensitive knowledge of Chinese life with a love of food. And so we learn all kinds of things about the important place of cooking in Chinese life, and a reverence for food miles away from our careless attitude to Chinese takeout. Instead, the ceremony of preparing and dishing meals is central to the whole fabric of Chinese family life. Against this tantalizing background rushes the story of an American journalist, recently widowed when her husband was killed in a car accident. Grief-struck, she accepts an assignment in Beijing to cover a legendary chef, American-born but half-Chinese. 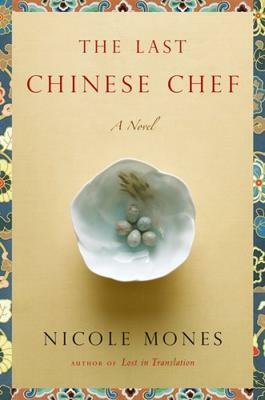 The story weaves gently and convincingly between the chef rediscovering his ancestors who had made their mark in the Chinese culinary world, and the American widow coming to grips with some of her own personal problems. Throughout the story they partake of fantastic dinners with menus and recipes for anyone interested…almost too many…but always impressive and surprising. With China looming all around us, economically and politically, it’s both a pleasure and a help to dip into its ancient and stunning history regarding putting food on the table. Nicole Mones has already won recognition for her books “Lost in Translation” and “A Cup of Light”. She has another winner with this one.